The first all-new 2D Mario platformer since Super Mario World has arrived! Boasting incredible 3D graphics to accompany classic 2D gameplay, this fast-paced adventure will have Mario fans cheering as they make their way over fields, under water, through castles, and into the air. The power of the DS is used to great effect, and the result is that the Mushroom Kingdom looks more alive than ever. Backgrounds are beautifully layered and every character on screen is presented in gorgeous 3D, with Piranha Plants baring their teeth with wild abandon and Goombas looking almost too cute to stomp on. Just below the surface you will find hundreds of hard-as-nails mini-missions that will force you to reconsider your supposed Super Mario supremacy. The real challenge of the game is tracking down its 240 Star Coins, which allow you to open up paths on the eight world maps. Each level hides three of those shiny collectibles: sometimes they’re in plain sight but require a special skill in order to be reached. Other times they’re cleverly hidden, and sometimes you will need one of the game’s special new power-ups to find them. Nostalgic and new in equal doses, New Super Mario Bros. is, quite simply, a gem of a game. 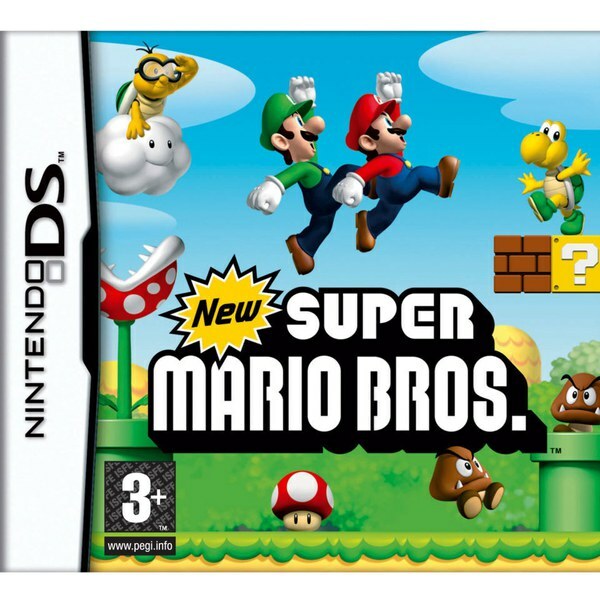 Gorgeous 3D graphics show off the power of DS as you run, jump and stomp your way through the Mushroom Kingdom. Play through hundreds of mini-missions as you try to track down precious Star Coins.